Disposable batteries (photo at right) should not be thrown away with your landfill rubbish because they contain toxic chemicals that may be harmful, and which should be recycled. Despite this, at present more than 95% of disposable batteries end up in landfill. In addition, all shops that sell batteries in reasonable quantities (at least one pack per day) must now provide a box or bin for recycling used ones. 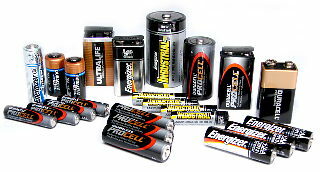 You can also take used batteries to the local waste disposal site in Drayton. But why not switch to rechargeables? When buying, note that the battery capacity varies with price – it is marked on the pack in mAh (milliamp-hours). 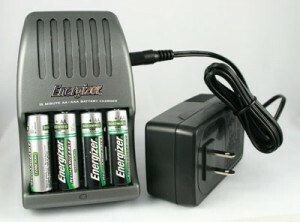 NiMH batteries can be recharged 100–1000 times. Rechargeable lithium-ion (Li-ion) and lithium-ion polymer batteries hold much more charge but are also more expensive – they tend to come mainly in custom sizes and shapes for everything from mobile phones, cameras, laptop computers and power tools to forthcoming hybrid cars. The photo below shows lithium-ion batteries for a laptop and a garden trimmer.